CW: We discuss Doki Doki Literature Club, which (poorly) handles themes of anxiety, self-harm, and suicide. We also touch on the transphobia present within the game’s fanbase. Fireside Friends returns with the original crew and a new format! In our first segment, we talk about anime, various visual novels, and recount our experiences with attending gaming and science fiction conventions. In our second segment, we discuss Doki Doki Literature Club! We focus on the way the game approaches the topic of mental health, the shattering of the game’s fourth wall, and its toxic community. 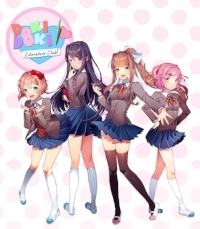 Discussion of Doki Doki Literature Club begins at 53:40. Next month’s shared experience is The Circle!